Click to get a FREE 5-variable version now! Global-OPT is our proprietary and patented Pattern Search, Derivative-Free Optimizer for NON-LINEAR problem solving. It uses Design of Experiments to determine the Global optimum. It can optimize Smooth and not-Smooth, continuous and DISCRETE variable problems. Global-OPT picks up where �Solver� and other software optimizers leave off. Global-OPT is the deterministic, model-based design optimizer that everyone can use. 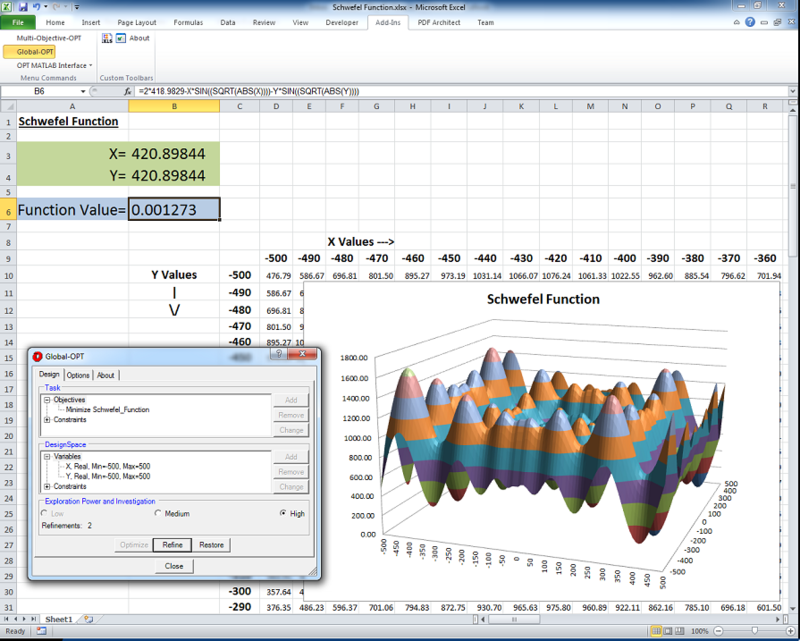 Our entry-level Microsoft Excel (Office 2000 or higher) Add-In optimization software product. Global-OPT is a single objective, multiple constraint, non-linear problem solving and model optimizing software tool. Global-OPT makes child�s play of finding the global optimum of the pathological Schwefel function, a common Global Optimization problem known for being difficult to solve as it has a geometrically distant global minimum where many optimization algorithms will get stuck in local optima, never finding the global minimum. � And lastly, press the 'Optimize' button to find the Global Optimum. Hit 'Refine' twice to get the result shown below. In a few seconds the coordinates of the minimum value appears. Below you can see the intuitive Global-OPT dialog box and the solution in the spreadsheet. � It is an order of magnitude easier to use than competing systems. Global optimization tasks are defined in intuitive application performance terms not by abstract mathematical expressions. � The solution is starting point independent. � The solution is repeatable. � It combines robust, full-factorial design of experiments (DoE) with OPTIMUM�s patented global optimization algorithms to solve problems and optimize models with a minimum number of calculations. � It is far superior to �genetic/evolutionary algorithms�. It performs fast and economical single-objective global optimizations. The Global-OPT paradigm is a �game changer� for engineers, designers, scientists and analysts.